It was a question which, up until New Year’s Day, many at Kettering Town has preferred not to answer. Perhaps a bit of reverse psychology was involved, perhaps no-one (correctly) wanted to jump the gun. But it was a question that could not be ignored after the Poppies produced a gritty display to edge out morning leaders King’s Lynn Town 1-0 in the first game of 2018 at Latimer Park. The first 1,000-plus crowd of the season were on hand to witness Kettering produce an excellent defensive display with goalkeeper Paul White deservedly picking up the man-of-the-match award as they kept a highly-impressive Linnets side at bay. 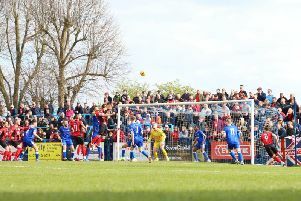 Top scorer Aaron O’Connor hit the winner – his 20th goal in all competitions this season – and, despite having midfielder Michael Richens sent-off, the Poppies saw things out to move two points clear at the top of the Evo-Stik South League Premier. The question on everyone’s lips was about to be answered by boss Marcus Law but the focus has already switched to trying to ensure they stay there for the next four months or so. For that to happen, they will need slip ups from title favourites Hereford who remain just five points behind with four games in hand and also Slough Town who could yet overhaul them. Those two meet this weekend while the Poppies face up to two very tricky away matches. They head to Basingstoke Town – beaten just twice at home this season despite sitting in 17th place – tomorrow (Saturday) before a long trip to fifth-placed Tiverton Town – who have lost just once on home soil in the league – next Tuesday night. So, are the Poppies now genuine title contenders? “I’d say so, yes,” Law said. “When you are top of the league with four months to go and past the halfway mark then I think it’s a fair comment. “Don’t get me wrong, there will be a lot of ups and downs and it will be a rollercoaster ride. “We are just fighting for every three points because in every game, every team is there to be shot at. “If you want to be the champions, you have to make sure you go into every game with the same attitude. “You also have to deal with every scenario because we didn’t expect King’s Lynn to be that superior on the ball on Monday and the fact that we dealt with that as much as we could was good to see. “We are going to be watching the likes of Hereford and Slough play their games in hand over the new few weeks. The Poppies will be without Richens for a long spell now as his red card for an off-the-ball incident on Monday came while he already had a three-match ban hanging over him for an accumulation of bookings. And the club moved quickly to bring in some cover as youngster Kyle Barker joined on loan from Peterborough United yesterday (Thursday). And they will be checking up on the fitness of central defender Gary Mulligan who missed the win over King’s Lynn due to suffering from back spasms.